KLH conjugated synthetic peptide corresponding to amino acid residues surrounding Y641 of human MCAM. MCAM (also termed CD146 or MUC18) is a cell-adhesion molecule belonging to the immunoglobulin gene superfamily. It mediates cell-cell interaction through heterophilic Mel-CAM/ligand adhesion. 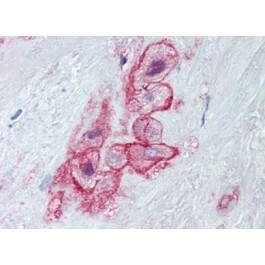 MCAM has been shown to expressed widely in normal and neoplastic human tissues. MUC18 expression is increased during prostate cancer initiation (high grade PIN) and progression to carcinoma, and in metastatic cell lines and metastatic carcinoma. 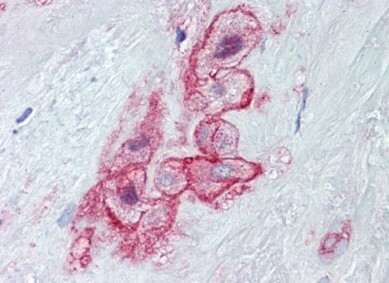 This antibody reacts to Melanoma Cell Adhesion Molecule (MCAM/MUC18).